Do templates make proposal creation easier, result in better quality, or destroy your chances of winning? First, let’s make a distinction between templates for formatting vs. templates for content. This article is about using templates for content, organization, or reusing previous proposals. The type of offering. If you are proposing a unique or engineered solution, you probably can’t use a template or reuse content and still be competitive. If you are proposing a product or a commoditized service, you may be able to employ reuse material effectively, but only if your customers' concerns are also consistent. When you recycle proposal content, the odds are that you will end up with a proposal that is not written from the current customer’s perspective. Even when you propose the exact same thing to two different customers, the description of what it will produce, deliver, or achieve should be different. The consistency of RFPs. If your RFPs are very consistent, you may be able to use reuse material effectively. If your proposals don’t have a written RFP, then whether you can effectively employ reuse material will depend on the consistency of your customers’ concerns and evaluation processes. The same offering could lead to increased efficiency, better performance, or improved quality. But which does this customer find compelling? Everything you say about your offering needs to be put into the right context. It’s how much that context changes from one proposal to the next that impacts whether using a proposal template will help or hurt. 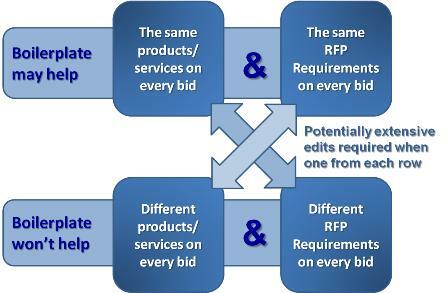 Templates and reuse works best when you are offering the same services/products on every bid and the RFP is the same each time. Templates and reuse require time-consuming edits when you offer different services/products on every bid and the RFP is different each time. In addition, the following concerns can also impact whether or not using a template will be a savior or destroyer of your proposal. The strength of your writers. If you have weak writers, you may want to rely more on reuse material. Instead of training and guiding them through the process of creating winning proposal copy, it may be easier to write something good once and then reuse it often. However, this can be dangerous. Even if you provide detailed checklists and guidance, if the writers are weak to begin with, you may find that you are submitting proposals that are not customized and your win rate will suffer. The size of the proposal and your profit margin. It makes no sense to invest in winning if you do but don’t make enough money to cover the cost of the proposal. While we might argue that if this is the case you shouldn’t bid, it is possible to profitably sell a commodity with razor thin margins at high volume. If you are in this category then you have no choice but to automate. Then the question becomes, how can you automate while still producing a competitive proposal? It is important to remember that there is a difference between being similar and being the same. 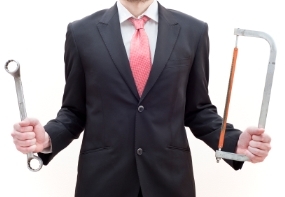 Most of your offerings and most of your RFPs will be similar. They may be about the same things. But unless they ask for exactly the same things, in the same order, using the same terminology, and evaluate them against the same terminology, the response will have to be different. The amount of that difference is what determines whether templates or reuse helps or hurts. If you are seeking proposal templates to “make proposals easier,” keep in mind that proposals are an investment. If you underinvest, you reduce your return on investment. At any established company, your win rate matters more than the cost of your proposals. If you manage your finances by focusing on proposals as a cost, then the reduction in win rate may end up costing you far more than any savings. The reverse is true. If you invest in creating more competitive proposals, the increase in win rate can generate a return far larger than that investment. Do the math. Compare what a change of just a few percent in your win rate returns, compared to the size of what you spend producing proposals. For each $10 million in proposals you submit, a 1% change in win rate is $100 thousand. To get a 10% or more increase in win rate, you need to go from writing good proposals to writing great proposals. To do that, you need to write your proposals from the customer’s perspective. Proposal templates are about standardization. The customer’s perspective is not standardized. You will never get a great proposal from a template. So maybe the real question that determines whether you should use a proposal template or recycle your proposal content is whether you can win with a cheap proposal that’s not great. And if you are thinking about building your company’s proposal process around templates, you might also ask whether you want to base your company’s whole approach to winning new business on cheap proposals that are not great? Do the win rate math and then decide.